July | 2015 | cut it out, stitch it up! Since the beginning of June I’ve not had much chance to do much sewing of any kind. Work and just life in general have got in the way of my plans! One job that I really wanted to get done was to decorate the dining room. There had been lots of thinking but very little action. But I’m glad to say it’s now finished apart from a bit of touching up the woodwork. For the new curtains I’d found a fabric in John Lewis which I really liked, Seedhead in Citrine but when I totted up the cost of making a pair, just over 10mts of fabric at £20, 10mts of lining and 10mts of interlining plus heading tape I was looking at nearly £300. I took a look at their ready made range and even though Citrine wasn’t available they had the same design in steel which I also liked. 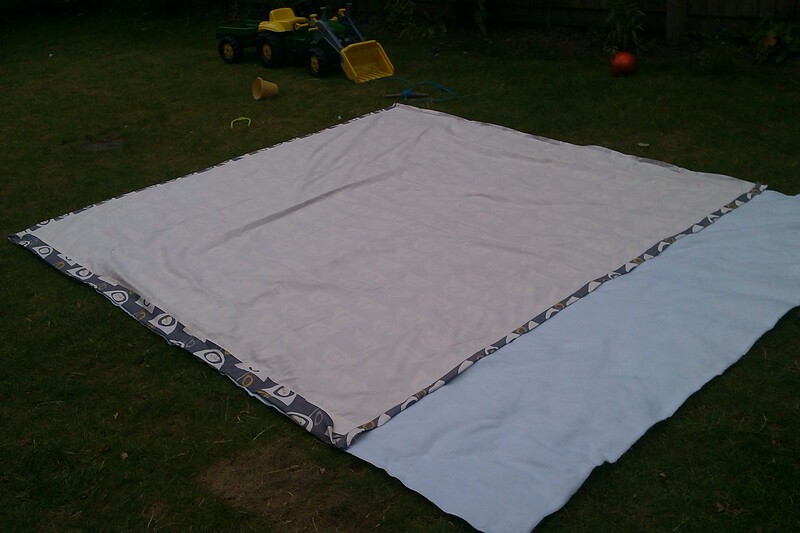 So I bought the biggest pair for £140 and planned to take them apart and add interlining. Me and curtains go back a long way……. When I finished studying way back in the early 90’s I graduated in to a recession and couldn’t get a job in my chosen field. So I took myself off to the job centre in Liverpool near to where I was living at the time and saw an advert for an interior design shop looking for a sales assistant. The wages were terrible but it was a job! I used to serve the customers so I learnt how to work out meterage for curtains along with allowing for pattern matching then I would be upstairs in the workroom sewing up the orders. I did this for nearly 3 years before I got a break and found a technical job in a clothing firm. And because of this I always make my own curtains from scratch so buying ready made was strange and then taking apart something you’ve just paid £140 didn’t feel right! But luckily it all went as planned. I bought the interlining from Roomserve on e-Bay for £32.95 for 10mts. I think interlining curtains makes them really special, I just love the weight it gives them and the way they hang and it definitely does help with keeping the cold out in the winter. I took the header tape off the top edges and then undid the hems. The hems were sewn with a blind hem stitch which if you pull the thread in the right direction it will just easily unravel. I did think I’d have to unpick one of the side seams to add the interlining but I thought I’d have a go at cutting the interlining to the right width and sliding it in. It didn’t quite slide in as it took a bit of wrestling to get flat but I got there in the end. I was able to do this in the garden on the hottest day of the year a few weeks back and was able to stay out till 10pm hand stitching the hems. I also added a stitch every 6 inches up the side returns to keep the interlining in place. 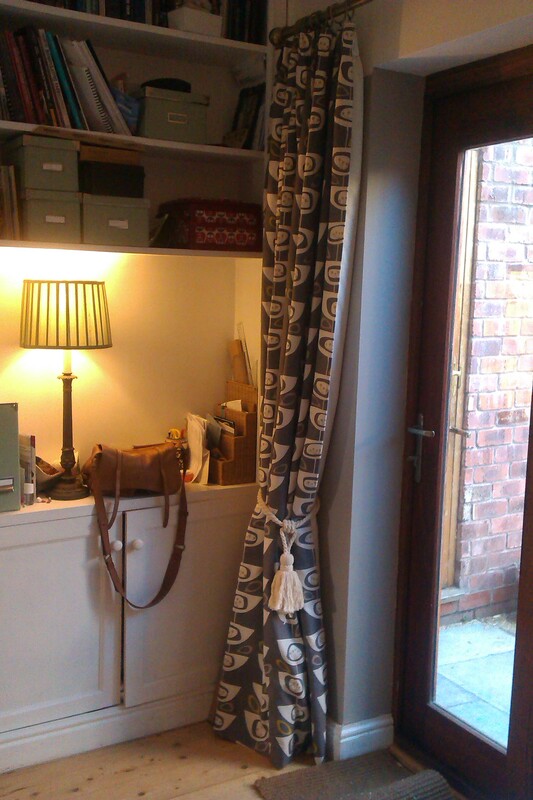 I then cut the curtains to the length I needed and re-applied the header tape. I cut the interlining to the exact length to avoid folding over and adding any unnecessary bulk. 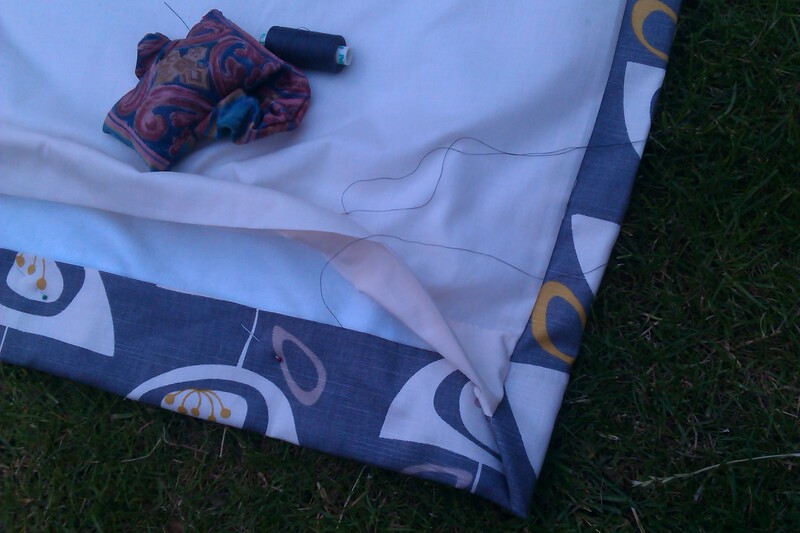 The lining used in the ready made curtains was a polycotton and the 3″ pencil pleat tape was definitely budget. Even though I wouldn’t have bought that quality of lining or tape they were fine to re-use. I suppose it is what was needed to get these to retail at £140. The whole job probably took me the same amount of time it would have done to start from scratch but I got the look I wanted for over £100 less. 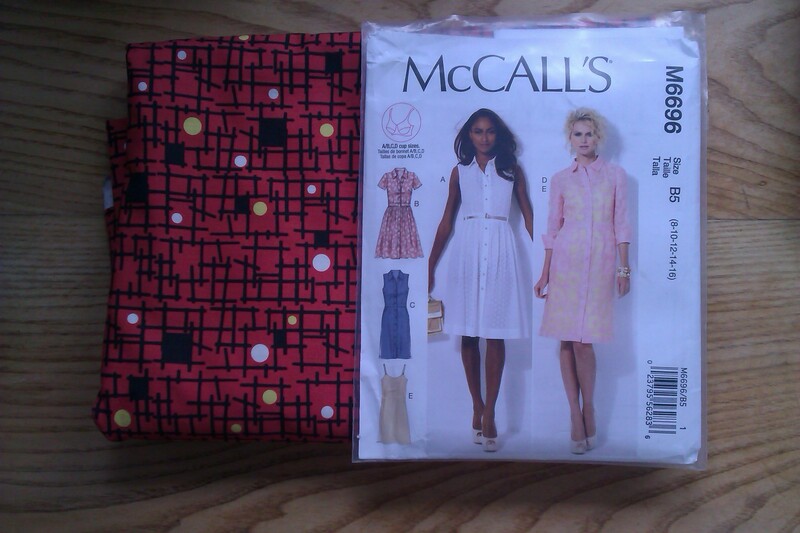 So now these are out of the way I’m going to start on McCalls M6696 shirtwaister dress using the Hemingway Designs fabric I bought earlier this year. Then before long it’ll be time to start planning for Autum makes.